‘Teen Beach Movie’ Star Mollee Gray Lands Leading Role In Indie Thriller ‘Deceived’! From a former finalist on So You Think You Can Dance? to a singing 50’s beach babe in Disney Channel’s Teen Beach Movie, 23-year-old rising star Mollee Gray has taken her acting talents to a new level as she lands the leading role in the new Indie thriller, Deceived! According to The Wrap, the film follows the lives of two high school lovers, Connor and Amanda (Mollee Gray). When Amanda finds out she’s pregnant with Connor’s baby, she gets mad, but soon becomes saddened after learning her boyfriend impregnated another girl named Heather. Unfortunately, due to these circumstances, and constant bullying by Heather, young Amanda makes a decision to allow her older sister, who is unable to have children, adopt the baby. However, it seems Heather might be a dangerous sociopath who wants to wipe out her rival in love for good. This definitely sounds like an amazing movie to look forward to, right? A release date for the film has not been set yet, but you can keep up to date on Deceived and Mollee Gray by checking back with us! 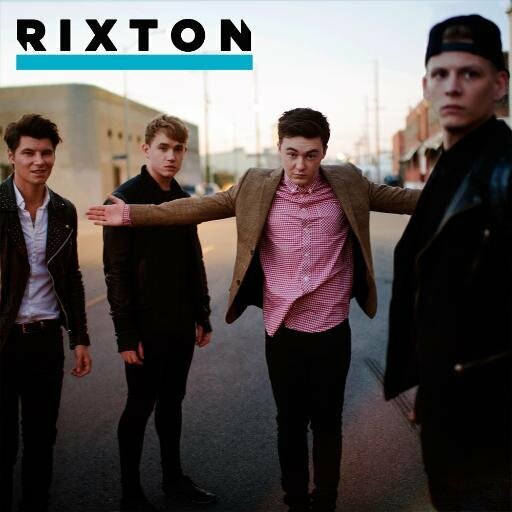 Samsung Users Can Hear Rixton’s New Single “Beautiful Excuses” FIRST! 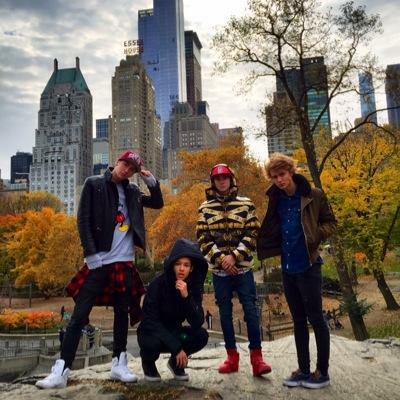 If you’re a Rixton fan, and Samsung Mobile user, you’re in for a pretty awesome treat! According to the guys on their Twitter very recently, all Samsung users have the chance to listen to their new hit “Beautiful Excuses” exclusively through Samsung Mobile! Just head HERE to learn more! 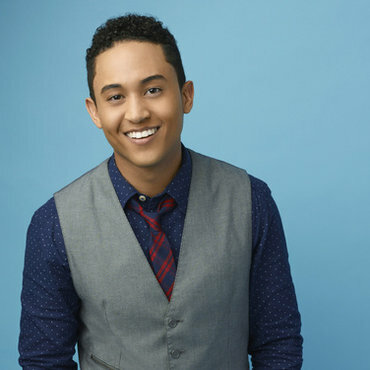 TI Exclusive: ‘Baby Daddy’s’ Tahj Mowry on Christmas Special & More! Moderator: What can you tell us about Tucker’s role in the Baby Daddy Christmas Special? Tahj: Tucker has a really cool role in the Christmas special, actually! First of all, it’s like an It’s a Wonderful Life theme, and Ben is over Christmas –Danny and Tucker are responsible for getting the tree. Tucker has a very hilarious scene getting the tree that will probably be the next gif online. It’s very funny, and we also get to hear Tucker sing, because there’s sort of a Wheeler family band scene in this episode. It’s just a great episode altogether. I think people will love it! Moderator: How hard is it to keep a straight face while filming? Tahj: It’s really hard, especially for Jean-Luc [Bilodeau] and I; it’s just really hard for us to not laugh when we’re in a scene together. It doesn’t matter what we’re filming — especially if it’s a scene where we have to be serious, because it’s just so difficult for some reason. We have a lot of trouble and obviously any scene is up for grabs — anybody can bust out laughing at any moment because you never know what’s going to happen. Moderator: Do you have any family traditions for the holiday season? Tahj: Oh, yes! We watch Christmas movies like nobody’s business all throughout December. The closer we get to Christmas we all go to our mom’s house, and we’re just sitting in front of the television, and our favorites are Home Alone 1&2, and The Santa Clause, we know all the lines by heart. We’re not even really watching it; we’re basically performing it in the living room [laughs]. It’s just a great family time for us. We love Christmas. Moderator: What do you love most about your character Tucker? There’s never a dull moment in his life. He has a cool job. He’s a really fun guy to play, and it’s also cool to be the funny guy — but then he’s sort of the one that keeps everybody together. Riley comes to him about her issues even though he doesn’t want to hear it, but he will still give his two cents and help. He does care. It’s fun because I get to say the most ridiculous things on camera – it’s always fun! Moderator: Do you consider the cast like a second family? Tahj: Oh yes! I see them more than my real family [laughs]. For example, Melissa [Peterman] and I saw each other recently for almost two weeks straight. We were laughing about it because no matter how much time we spend together, I can’t get enough of her. It’s great! We all hang out on and off the set. We love going to the movies. Jean-Luc and I are like brothers – he’s like my little brother. And Chelsea [Kane] is like the younger sister I never had. We’re all family. Moderator: Do you and Chelsea ever bond over your Disney Channel background? Tahj: Yes! We have really funny conversations about Disney Channel all the time. Just because we both can relate — I think that’s why we became so close right off the bat. She’s a doll, I love her. We reminisce all the time. It’s funny because we weren’t on Disney at the same time, but it’s still funny because most of our stories still match up. It was such a fun time and we laugh about it all the time. Moderator: What was it like filming the Christmas episode in the summer? Tahj: That was actually really interesting because there’s a really funny scene with me getting the Christmas tree. We filmed that scene outside and I’m bundled up in gloves, a scarf and one of those fluffy hats but it was just so hot outside! I mean we have it easy [laughs]. We work on a sound stage so you know I can’t complain too much. Moderator: Are you on team Danny or team Ben when it comes to Riley? Tahj: I don’t even know anymore! I honestly feel like there’s parts of them both that she’s in love with, and at some point she’s just going to have to compromise. One of them has one thing and then the other one doesn’t, and vice versa. I’m team both. I just want Riley happy! Moderator: What’s your favorite gift that you’ve ever received and given? Tahj: Honestly, I love every gift I give my family and my friends! I love Christmas shopping for people I love. I love watching people open any gift that I give them — there’s something satisfying about it! When I was younger there was this robot toy called the My Pal 2 that I was really stoked about. My dad got it before Christmas and we had this whole plan to act like I hadn’t seen it before. So when I opened it, I was like, “Oh my gosh!” [laughs]. That was probably my favorite toy that I received. Moderator: What is your favorite Christmas carol? Tahj: I love, “Oh, Come, All Ye Faithful,” which is the song I sing on Baby Daddy for the Christmas episode. That’s a beautiful song. And the Wheeler family band, we sort of remix it out and make it our spin. It’s really cool! Moderator: Who would you say is most excited cast member for the upcoming holiday? Tahj: I’m going to have to go with me. The guys are coming tomorrow to start working on the lights for the house and I’m so stoked! Moderator: What’s it like filming in front of a live studio audience? Tahj: It’s fun! It’s something I’ve been doing for a really long time and still love. My next project might not be a sitcom, but I’ll always do sitcom just because it’s so fun and it’s instant satisfaction and gratification. When you say a joke and the audience responds right away. It’s just like, “Oh, wow, this is awesome!” They’re into it. They’re feeding off of us – it’s kind of like a play. The entire cast and I, we’ve been doing it for a while now, this is our fourth season, and it’s like clockwork now. We feed off of each other, we can say things that may not be written and still keep going with it. It’s never ending. It’s always fun. Moderator: Do you have any New Year’s plans or goals for 2015? 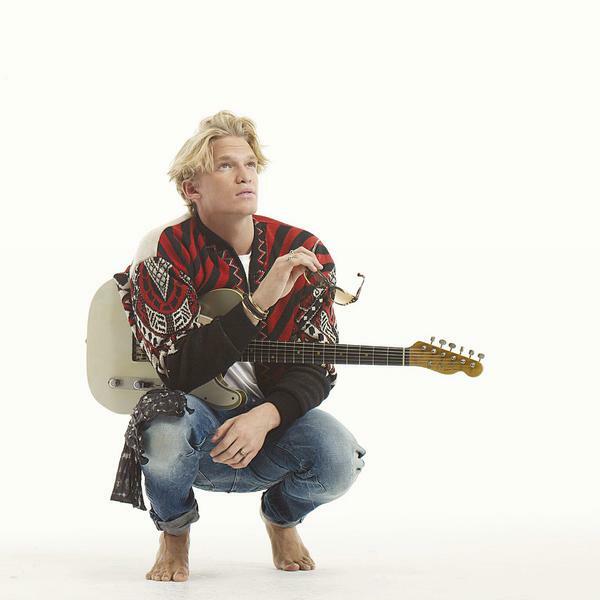 Tahj: I’m about to come out with my music in 2015, so that’s probably my biggest excitement. Also, Baby Daddy’s Season 4 premieres on January 14 — so it’s going to be a really fun year for me! I’m looking forward to a positive and fruitful year. Jordan JAE Covers Ariana Grande’s “My Everything” — Watch! Fifteen-year-old singer-songwriter, Jordan JAE, has made quite a name for herself over the last year with the release of her two powerful original singles, “Said No One Ever” and “Makin Me Crazy.” The New York City-based teen is also gaining ground with her YouTube cover video series where she’s covered a diverse playlist of artists including Coldplay, Ed Sheeran, Katy Perry, The Beatles and more. You can go ahead to listen and watch exclusively on PopCrush or you can check out the video below! Let us know what you think of it! 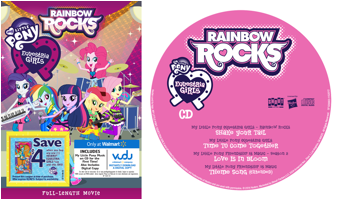 ‘My Little Pony Equestria Girls: Rainbow Rocks’ To Release On Blu-Ray/DVD 10/28! There’s a brand new full-length film in the ever-popular My Little Pony canon. Following a theatrical run in the fall of 2014, where the film opened with enthusiastic reviews to packed crowds in over 400 theaters, My Little Pony Equestria Girls: Rainbow Rocks will be released October 28 in the U.S. and Canada from Shout! 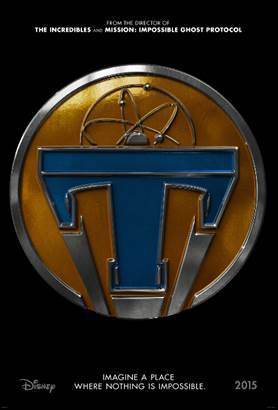 Factory Kids, in collaboration with Hasbro Studios, as a single-disc DVD, and in a Blu-ray/DVD/Digital Copy combo. Bonus features include an Audio Commentary, 8 Prequel Shorts and Sing-Alongs. Now, the girls of Canterlot High are back, and this time they’re rocking guitars! In My Little Pony Equestria Girls: Rainbow Rocks, Canterlot High (CHS) is hosting a musical showcase, and Rainbow Dash, Applejack, Pinkie Pie, Rarity, and Fluttershy are going to be performing with their new band, The Rainbooms. But when The Dazzlings, a new girl group, arrive at CHS and convince everyone to turn the friendly showcase into a Battle of the Bands, tensions mount between the competing musical acts. A now-reformed Sunset Shimmer realizes that The Dazzlings may not be ordinary girls and are after something far more sinister than just being named Best Band at Canterlot High. The Rainbooms call on Princess Twilight to restore harmony to their world to help them perform a musical counter-spell so that they can win a battle that now determines the fate of the entire school. My Little Pony Equestria Girls: Rainbow Rocks is now available for pre-order at Amazon.com, ShoutFactory.com, Target.com, and Walmart.com, and will be in stores everywhere October 28. Additionally, there are fun My Little Pony Equestria Girls: Rainbow Rocks exclusive version at select retailers which you can check out below! 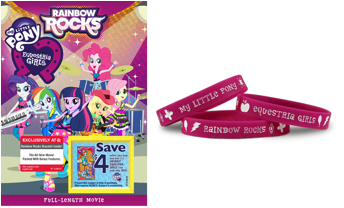 Target has an exclusive version of the My Little Pony Equestria Girls: Rainbow Rocks DVD, which has a Rainbow Rocks bracelet inside along with a coupon to save $4 when you buy any one Equestria Girls toy and the DVD! 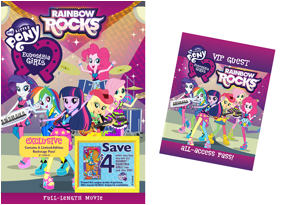 Kmart is offering an exclusive version of the My Little Pony Equestria Girls: Rainbow Rocks DVD that includes an exclusive Limited-Edition Rainbow Rocks Backstage Pass and a coupon to save $4 when you buy any one Equestria Girls toy and the DVD! Check out the trailer for My Little Pony Equestria Girls: Rainbow Rocks below!